Getting an unexpected add-on to your food order might be nice if say, you’re getting free extra cheese. But I’m going to go ahead and say no one would appreciate a metal bolt in their burger, like one Applebee’s customer is claiming after a recent visit. Too crunchy. 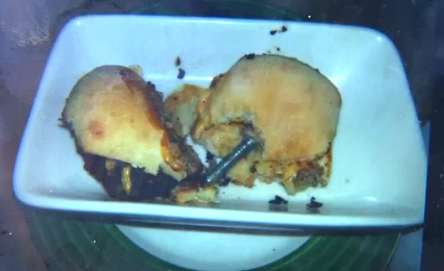 A customer at an Albuquerque Applebee’s says her meal was ruined on Saturday when she bit down on a metal bolt in her slider. “She bit into it and got a funny look on her face and we said what’s wrong?” her sister tells KOB News. What’s wrong is that the metal bolt she reportedly pulled out of her burger as an answer is not edible. The family immediately told the server about the UNFO (Unexpected Not Food Object) and was told there was no manager on duty, but that the meal would be free. That didn’t sit well with the family, especially when the table next to them ordered up — you guessed it — a plate of sliders. “I think they should have stopped selling the slider meat right then and there until they figure out where it came from, find out who processed the hamburger,” the customer’s sister said. An Applebee’s spokesman says the restaurant is glad the customer is safe, and that it’s investigating the matter to find out where the bolt came from and make sure proper food handling protocol was followed.